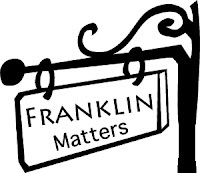 I will change my approach and NOT remove the Franklin Matters Facebook page. Rather than replay the full thread from Facebook, suffice to say, my logic fell apart on one key point that at least one of the three alternatives would be acceptable for most. For a variety of reasons, they are not. I appreciate your feedback.The posting process will continue to the website, Twitter, Facebook and the daily email. I will still encourage all to consider using one of the three if you really want everything that I do post. The one thing that neither of us can change is that Facebook will NOT show you all I post.